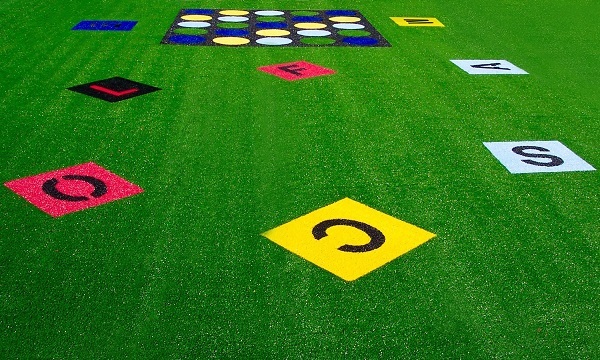 At Grassart, we create artificial grass elements for home, for play, for sport and for business. If you can imagine it, we can create it. So whether you need a branded mat or runner for a corporate event, a new playground surface with games, or a club logo in the middle of a sports field, we have ways to make it wonderful. 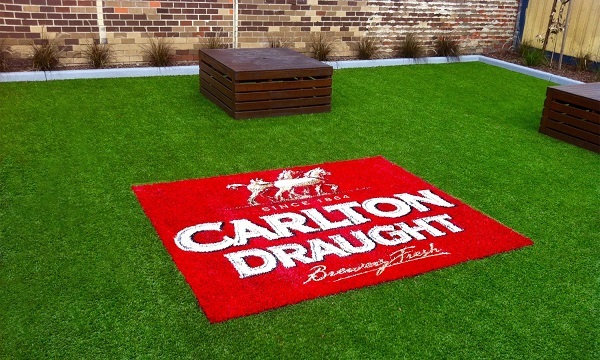 Created using state of the art technology developed by Signgrass in Europe, our rugs, mats and runners are colourful, hard-wearing and perfect for Australia's outdoors. But the good news is, they look absolutely striking when used indoors as well. Our product is not made in China and we believe, you won't find this quality anywhere else. We can create logos in almost any shape with almost any graphic. This can be done with pile heights up to 60mm, in 4 yarn types and in a wide choice of colours. ​This sports logo for a school in The Philippines is a great example of the detail that can be achieved with our tufting. You can actually see the branding and how it can be made quite striking. Educational elements are great for kindergartens and school grounds. Aside from letters and numbers we have games like Snakes and Ladders as well as fun graphic elements. Whether it is for a special corporate event, or a permanent branding element for your office or sponsored location, it can be made quite striking. Simply provide us with a hi-res file.